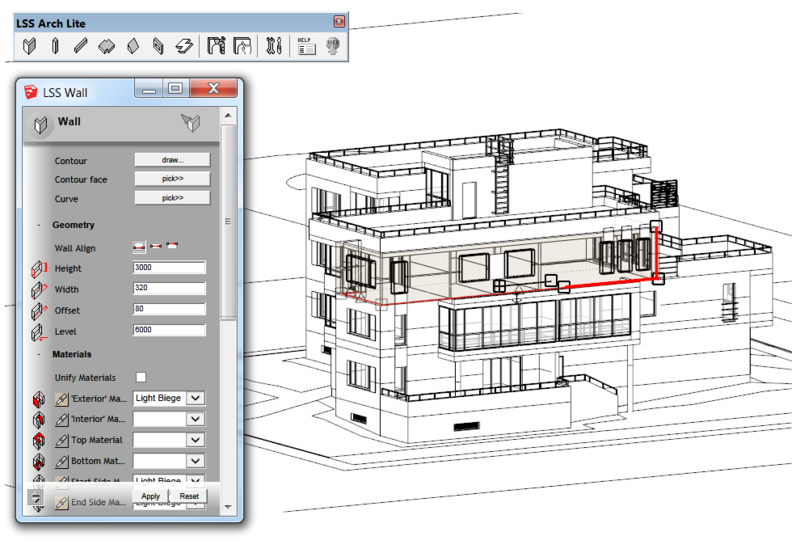 This extension is the simplified version of the LSS Arch extension and it allows to draw and edit only basic building elements, such as walls, columns, slabs, etc. Note that the full version (LSS Arch) allows attaching labels, making lists, modelling advanced geometry like terrain meshes, and more. It is possible to rebuild manually edited objects (i.e. those edited with the native SketchUp tools) and to change parameters of selected objects that were previously created using the tools of the LSS Arch Lite extension. Find the 'LSS Arch Lite' toolbar within the list of toolbars. Tick the corresponding checkbox to enable the 'LSS Arch Lite' toolbar. [optional] Right-click anywhere at the SketchUp's toolbar area and enable 'LSS Arch Lite' toolbar using the pop-up menu. Choose the size of the LSS Arch Lite dialogs: standard or small. Set grips magnify factor that is appropriate for your screen resolution. Set the rotation adjustment point offset (the same logic here as for grips size). Open the tool dialog by clicking the appropriate speed-button of the LSS Arch Lite toolbar or by choosing the apropriate tool name from the Main Menu >> Plugins >> LSS Arch Lite. [optional] Adjust the settings of the 'arch' object: geometry, materials, identification, etc. Click topmost command button of the dialog to start the creation of an 'arch' object in the active model. Click at the starting point to begin drawing the contour of the object. Move the cursor and click to add new vertices to the contour or enter the offset value from the keyboard using the value control box (VCB). Double-click at the ending point or single-click at the ending point and press the <End> key to finish drawing the contour. [optional] Finish drawing the contour at the starting point.